This entry was posted on Wednesday, May 2nd, 2007 at 3:53 am	and is filed under Dogs, National Dog, Cat & Pet Info, News for Cats, Dogs & Owners. You can follow any responses to this entry through the RSS 2.0 feed. Both comments and pings are currently closed. That is awful. People never cease to amaze me. How cruel. Maybe baby oil? I know it will get sticky stuff off. (Like those price tags that they insist on putting on the front of picture frames ;-) Otherwise, I’d just let it grow out. Please don’t use anything caustic. It never fails to amaze me how some people treat animals! It will grow out. My brother-in-law has two foxhounds from a shelter. One had a number bleached into his side and the other had the number painted on when he got her. They both grew out. I may get blasted for saying this, but what is cruel is that the dog’s owner lets him wander around the neighbourhood. He stays MAINLY in his own yard? He shouldn’t be ABLE to get out of his own yard. He gets out of the yard because your yard is not secured, lady. One day, while he’s walking the kids to the bus or merrily wandering around the neighbourhood, he’s gonna see a squirrel and chase it and when he gets *hit by the bus that is coming to pick up the neighbourhood children, you’re going to *wish it had just been spray paint on your dog. Instead of worrying how to get the paint off of Wiley, you should be wondering how to fix your fence so that Wiley can’t get out. If you love him, you need to keep him SAFE at home. So the dog is out on his “7 o’clock run” and he spots a squirrel and chases it across the street. A car swerves to avoid hitting the dog and instead hits someone standing on the sidewalk, like maybe one of those kids who is waiting for the bus. “The Bannock County Sheriff’s Office says they are still investigating the case. IMO, the Bannock County Sherriff’s Office should be fining the owner *and warning her of the danger to Riley and others. It’s not like this dog escaped from the yard just once. It sounds as if he goes (unattended) on a daily romp through the neighbourhood, when in fact, he should not be leaving the owner’s property without her and without being safely on a leash. The paint will grow out of his fur. But I’m afraid that there is a real tragedy just waiting to happen. I agree Bichon Mom - it is cruel and irresponsible to let him wander. The days are long gone when dogs could just be “let out” to roam the neighborhood. 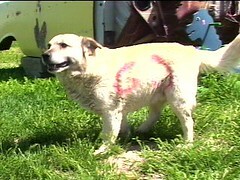 Spray painting the dog was not a responsible thing to do either. How about walking Wiley back home on a leash and talking to the owner about why you don’t like having him wander into your yard, etc, etc.